I have literally been sitting here for 5 whole minutes straight, staring at a white screen with a blinking cursor. Why? Because how does one even begin to describe their love for something like a red velvet cupcake OR piece of cake? I mean, every possible word I have thought to use to describe to you all, just falls short. Words don't do justice to the love my heart (and tastebuds) have for this lovely thang. Maybe that paragraph is good enough. 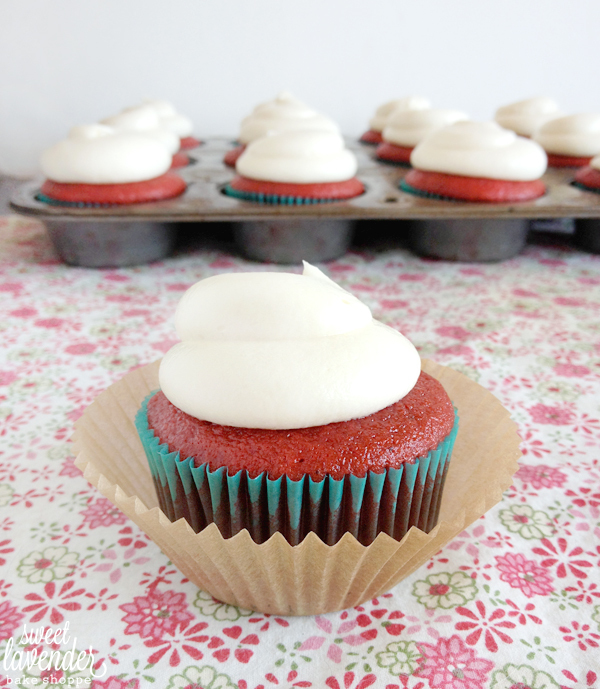 Oh and by the way, red velvet needs to have cream cheese frosting. ALWAYS. Don't even try to put anything other than that on top. A friend recently told me he knew someone who put vanilla buttercream on top of their version. I almost got my keys right then and there and drove to their house with the "crazy look" in my eyes and.........'Nuff said. Here's some funny truth: Up until like...2005 or something, I didn't even know red velvet cake existed. Isn't that just the craziest thing you've ever heard?!?!? It's only because of this truth that my heart pitter patters for other desserts. I had a whole 21 years to develop serious crushes on things other than my beloved red velvet. And let's be honest- should my mom have shoved a baby food version of pureed red velvet into my mouth from day one, I most likely wouldn't even know other desserts exist! I love it THAT much! Boom. I just described my love adaquately. Some people might ask, "Christina, why do you love it so much?" to which I would just laugh and laugh and laugh until I started crying uncontrollably (believe me....it happens more often than I'd like to admit)..(PS- my husband loves when it happens. He thinks it's the FUNNIEST thing in the whole wide world)...(PPS- is PPS even a real thing? Because I've seen it used before and I've always wondered....) Anyway, I love red velvet 1. Because of it's color. Yes, I'm that shallow. I love colorful things. 2. Because it's a weird cross between vanilla cake and chocolate cake! But then it's neither at the same darn time. Because really, it's red velvet! It's not Vanocolate. It's also not Choconilla. So if you're like super indecisive one day and just canNOT decide for the life of you which flavor you'd like to munch on- red velvet hits all the right taste buds. 3. It's pretty. Did I say that already? 4. It comes with cream cheese frosting! (Again....never ever should any other frosting touch my red velvet). I love cream cheese frosting!! 5. ....I don't have a 5. It's just so so yummy. Another weird truth: I just found out a very dear friend of mine doesn't like red velvet. GASP! I mean, like, REALLY doesn't care for it. There was a plate in front of us (this is how I found out) and while I was munching on my 3rd cupcake, I looked at her and asked why she wasn't joining in on the FattyFest I was holding right next to her. Then my poor ears heard the horrid truth come out of her mouth. I almost defriended her (in real life, none of this shady Facebook business) right then and there. So because of my love for this darn thing, I have a weird obsession with trying as many red velvet recipes as I possibly can. A few years later, after trying A LOT of yummy (and not so yummy) recipes, I decided to create my own. I decided I didn't usually like (nor did I want) a recipe that uses vinegar in their batter. So, I did...I tested and tested and wrote and rewrote and worked and worked on my very own red velvet recipe. Although, there's still a little bit of tweaking that needs to be done, I'm still in love. It works for cupcakes, but for some reason, not in cake form- so we're working on that. Weirdest thing. Then I stumbled upon this recipe from Sweetapolita (I just love her, don't you???) and was SO intrigued! Yeah it uses vinegar (poo) BUT it also uses something I haven't seen in a red velvet recipe before- MAYO. Mayo-freaking-naise! I've seen and used it in dark chocolate cake....but red velvet??? I'm all in. I had to taste it, stat. I of course, tweaked the recipe to my liking, just a tad. I'm sorry, I can't help it! 1. Preheat oven to 350°F. Place cupcake liners into your cupcake pans. For this recipe I got about 15 cupcakes. 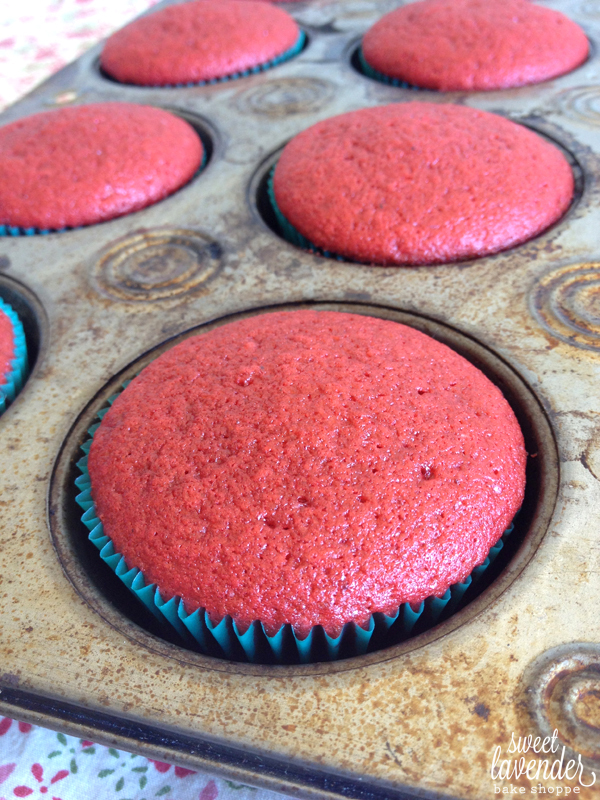 If you'd like, you can gently spray the top of your cupcake pan. Set aside. 2. In the bowl of your stand mixer, add your egg, egg yolk, brown sugar and vanilla sugar and beat with the paddle attachment on high speed until light and fluffy- about 3 minutes. 3. Stop mixer, scrape down sides and bottom of bowl and add your red food coloring and vanilla extract. Mix on medium speed until combined. Stop mixer again, scrape down sides and bottom, and add your oil and mayonnaise. Mix again on medium speed until combined. 4. While this is mixing, sift together your flours, cocoa powder, and salt into a bowl (or sheet of wax/parchment paper). Also, gently heat up your buttermilk until just warmed to the touch. Set aside. 5. While mixer is on low, alternate your dry ingredients with your buttermilk until all of each is added. Start with your dry ingredients and end with the dry. Mix until JUST combined. Stop mixer, scrape down sides and bottom of bowl, and mix quickly again. 6. In a small bowl mix together your baking soda and vinegar and quickly add to your batter while the mixer is on medium. Mix until combined. 7. Finally, pour (or scoop) batter into your cupcake liners and fill them about 2/3 of the way up. Place in preheated oven and bake for about 15 minutes- turning pans half way through baking. They're done when they've risen and a toothpick comes out with crumbs. Let cool in pan 5 minutes and then take out and allow to cool on a rack until completely cooled. 1. In the bowl of your stand mixer (make sure bowl is clean, dry and not warm) add your cream cheese and butter. Mix together with the paddle attachment on medium high speed until creamed together- about 1-2 minutes. 2. Add vanilla extract and continue mixing until combined. 3. Stop mixer and scrape down sides and bottom of bowl. Next, with mixer on low speed, slowly add your sifted powdered sugar. Mix on low until combined and then turn up speed to high and beat another 30 seconds. 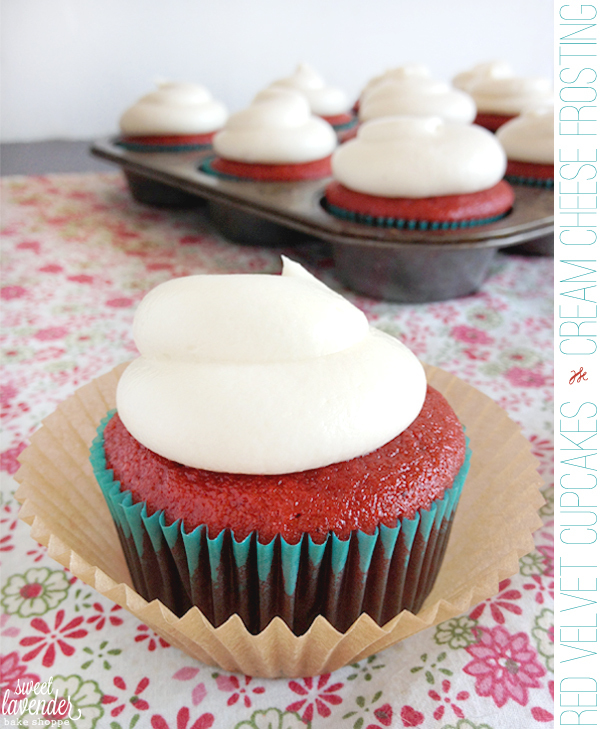 Once cupcakes are completely cooled, frost with your cream cheese frosting however you please! I chose to use a piping tip (because I'm fancy) but you can do so however you so desire! Cupcakes unfrosted, can be placed in an air tight container and stored in refrigerator for up to 2 days. I would recommend eating them within that next day once they are frosted (not re-storing them in the fridge). Frosted cupcakes can be stored room temperature for 1-2 days. Or you can store them in an air tight container in the fridge for 2-3 days. I would recommend removing them from the fridge at least an hour before you plan to consume, to allow to come to room temperature. Cream cheese frosting can be stored room temperature if you plan to use that day- with plastic wrap pressed directly onto the surface. OR it can be stored in an air tight container in the fridge for up to 5 days, just allow to come to room temperature before you plan to use. 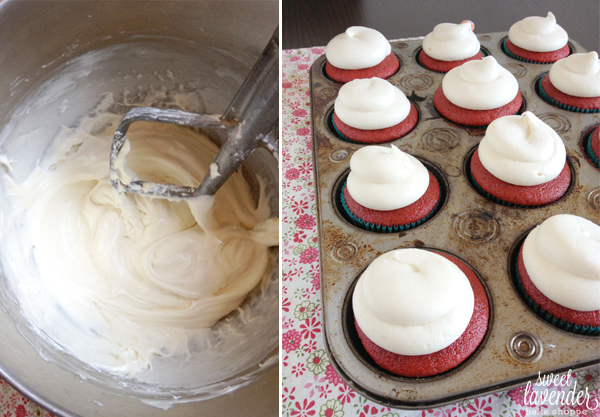 As Martha Stewart would say, "Red velvet cupcakes with cream cheese frosting...it's a good thing." Cream cheese frosting is my kryptonite. I will definitely try out this recipe! Happy Tues-errr Wednesday to you too! ;) I hear ya, Cream Cheese Frosting is one of those things that should be on EVERYTHING all the time. Found your blog through Kenzie's blog The Ashcraft Bunch and I am so glad I did! I love your blog! The design of it is beautiful! Hi Hi Hi new friend!!! SO glad you stopped by and liked what you saw! I hope to see you around here more and more! My My these cupcakes look soooo delightful! Now following. Looking forward to keeping up and getting to know you! I also have a blog design site. If you ever need a new custom design, check it out. every thing you makes looks PERFECT. seriously. love it. 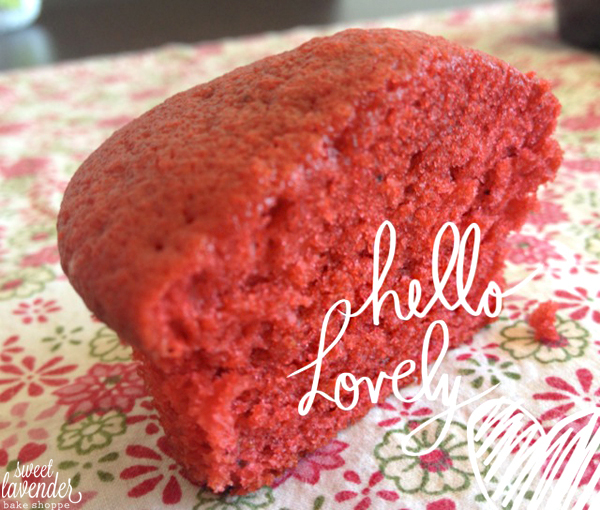 These look delicious- I love red velvets so much! Also, your blog design is just gorgeous. I love your header, it's beautiful! Aww thank you!!! The blog header is designed by my lovely friend, The French Press Mornings! Check her out! I'm sorry for you that you only discovered Red Cake in 2005. All those years you and your family have missed out on a special treat. :) For that reason I'm taking a minute to educate you about "Waldorf Astoria Red Cake" and about balancing flavors in the realm of cooking. This cake is historically made with a cooked frosting that is light-fluffy-creamy cooked roux frosting (also called ermine frosting). Now, I'm not against new-updated tastes and combinations but it's important to balance flavors, textures etc in our cooking. This frosting's consistency and sweet buttery flavor is the perfect match for the delicate the red cake. Cream cheese frosting is too tart and heavy and would overwhelm this cake. You all REALLY should try it! BTW- I LOVE cream cheese frosting but it is better suited for something hardier like a Carrot Cake.